South Korea and Kazakhstan continue to develop a broad array of cooperative efforts–in healthcare, retail, theme parks and energy. Each of the last three South Korean presidents made state visits and according to the South Korean Ambassador to Kazakhstan Baik Joohyeon 40,000 Koreans visited the Central Asian country in 2014, aided by the dropping of visa requirements for South Koreans under a pilot program intended to boost tourism. But Kazakhstanis don’t have to go all the way to South Korea to get South Korean medical care. In a recent visit to Astana, a delegation of South Koreans met with Deputy Prime Minister Berdybek Saparbayev to discuss ongoing cooperation efforts in the Kazakh healthcare industry. The South Korean delegation included the heads of Gangnam Severance, the Health Industry Development Institute and the International Health Centre, all of which operate health clinics in Kazakhstan. On the Kazakh side, in addition to the deputy prime minister, the heads of the healthcare and education ministries attended, as well as the head of Al-Farabi Kazakhstan National University, which hosts a diagnostic clinic operated in partnership with Gangnam Severance hospital. The agreements cover the regular treatment of Kazakhs in South Korean clinics as well as the training of local specialists. Cooperation between the two countries extends beyond healthcare. In Seoul this week, Lotte Group signed an memorandum of understanding with Astana Group to boost cooperation between the two conglomerations in retail and theme park development. Lotte Group is a massive multinational conglomerate headquartered in Seoul and Tokyo. The Group operates the largest confectionery manufacturer in South Korea, which made the leap to Kazakhstan in 2013 with the purchase of a local snack maker, Rakhat. Last year, Lotte’s fast food chain, Lotteria, signed a franchise contract with Astana Group to bring a coffee chain–Angel-in-us–to Kazakhstan. It’s not snacks or coffee, however, that drive the latest round of handshakes. 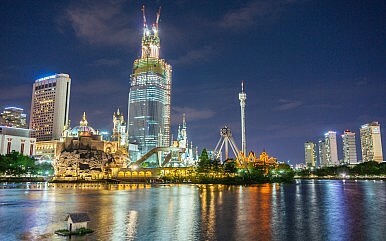 Lotte Group runs Lotte World in Seoul, one of the world’s largest indoor theme parks. The Astana Group, which primarily has its hands in the automotive industry and real estate development, is eager for the partnership to help develop its theme park business ahead of EXPO 2017, an international exposition schedule to take place in Astana in the summer of 2017. So far, 20 countries have confirmed their participation in the expo, including South Korea and Japan. Developments in healthcare, retail, and theme parks builds upon long-running cooperation in the energy and technology sector. In 2009, during his state visit, South Korean President Lee Myung-bak signed $5 billion in energy and technology deals. One part of that package was the building and operation of a coal-fired thermal power plant outside of Astana. Under the 2009 deal, Korea Electric Power Corp (KEPCO) and Samsung C&T were to hold a 65 percent stake, according to Reuters at the time. The Balkhash project, originally scheduled to be completed in 2014, was delayed by financial troubles but revived in 2014 during President Park Geun-hye’s visit.